Faripour Forouhar’s home is in New England but he grew up in high mountains of Middle Asia. He travels to the Rockies, Alps and Andes and the shorelines in US and Europe yearly to paint. He studied painting in Teheran University School of Fine Arts during college years. Later, he studied with the late Edgar Whitney from Pratt NYC and completed courses in The Grand Central Academy of Fine Art, NYC. He shares experience with other painters regularly. He is a scholar in the field of art and visual perception and has a deep interest in the evolution of painting throughout history. 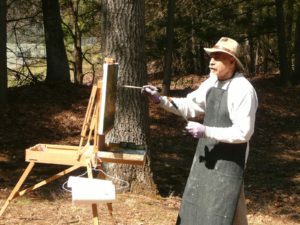 He started as a watercolorist painting plein air, ala prima. He has moved to oil on canvas with a style sensitive to subtle light, armospheric effect and space in the landscape. The resulting effect infuses the abstract compostion and reveals the painter’s character, vision and artistic creativity. The abstraction and distortion that is possible in painting makes it uniquely suitable for expression of the conscious and unconscious experience in a manner far truer and more intriguing than an accurate recording, for example, by a camera. The more subjective the experience, the more unique the expression. This principle applies to all forms of painting; figurative, imaginative and abstract. The challenge is in conscious understanding of the visual elements that effectuate the subjective experience, the “know yourself” – the artist’s vision – that matters most and the skill to lay it down on canvas with clarity. This is what I am trying to do. Member, Oil Painters of America, Beaux-Arts Realiste, Canada, Gallery on the Green, New Britain Art League. New Britain Museum of American Art 2012 and 2013, 43rd Annual Exhibition 44th Annual Exhibition. 1st. Place Prize, Art League of New Britain, Seeing Red. Most popular painting in Farmington Valley Art Center, Member’s Vote. Elected Artist Lyme Art Association.